The three-dimensional tracking system of the RK-F2 features a wide range of movement, so that the examinee’s pupil can be detected easily. 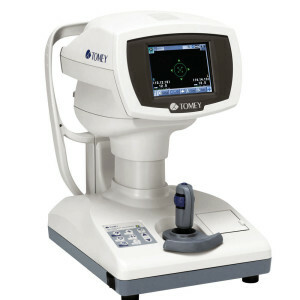 When in Full Auto mode, the unit is a one touch operation for auto-refraction and curvature measurement in both eyes. 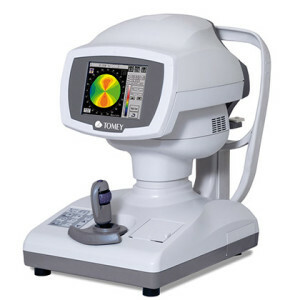 Just press the start button and the ref-keratometer automatically aligns and measures both eyes. For added flexibility, Auto and Manual measurement modes are included. At 2 mm, the small pupil mode helps contribute to an efficient screening and is useful when a patient’s pupils are difficult to dilate. The short reaching distance between the patient and operator allows closer personal interaction and easy access to the patient’s eyes. 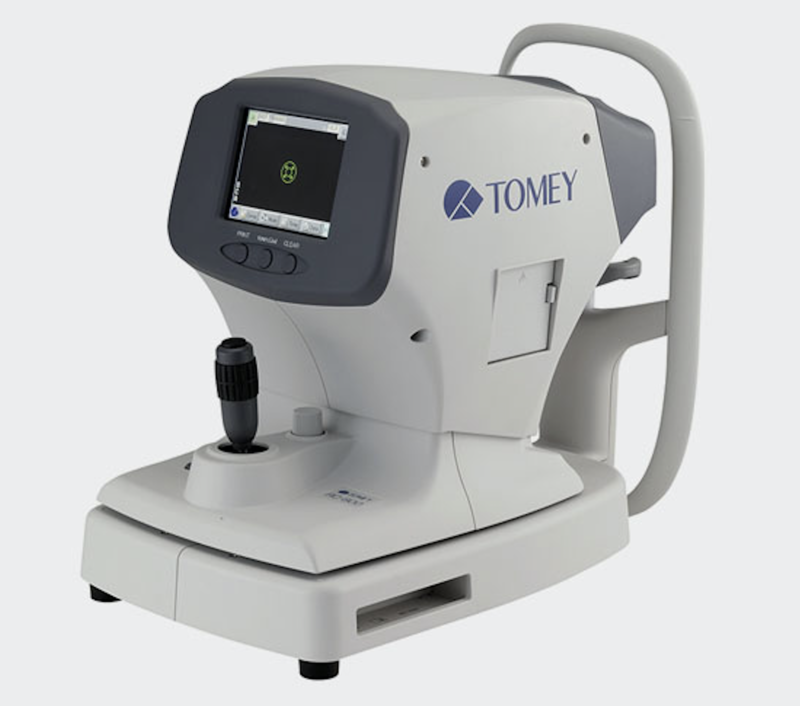 The peripheral keratometry mode provides accurate measurements for examining oblique astigmatisms and helps determine the best fit for a contact lens. 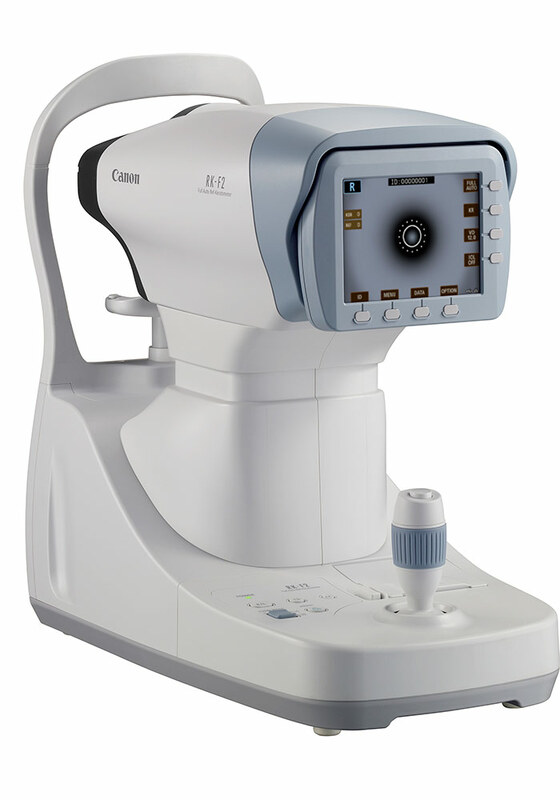 The RK-F2 can be used to make a series of measurements at a 30 degree angle from the eye’s center along the attentive meridians. The 14.5 cm (5.7 inches) color LCD monitor tilts 40° making the RK-F2 easy to use if the operator is sitting or standing. The clear LCD display also includes multi-functional screen buttons allowing the operator to switch menus as needed. 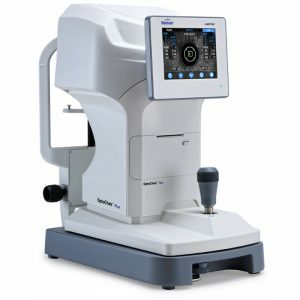 Aligning the patient’s eye is easy using the motorized omni-directional joystick with a fine focus dial. All positioning may be performed with one hand allowing the other hand to work with the patient, if needed. The top of the joystick button has the start button which can immediately be pressed once the patient is properly positioned.